Priyanka Chopra-Nick Jonas photos: The couple Priyanka Chopra-Nick Jonas are the paparazzi one of the favourite couples of the tinsel town. From their engagement to their outings, every single detail has garnered a lot of attention, Now, the latest photograph is surfacing on the internet. The couple attended the US open with their family. American singer Nick Jonas and Bollywood actor Priyanka Chopra are paparazzi’s favourite couple. Every now and then, the couple’s single glimpse becomes a talk of the town. Now, we come across with a yet another photograph from Nick Jonas’ Instagram fan page. It was a date night for the couple and they chose to spend it at US open. In the photograph, the much-in-love couple is seen walking hand-in-hand. The lovebirds look beautiful together. Priyanka looks gorgeous as ever in the red-white striped off-shoulder outfit. While Jonas looks dapper in a grey sweatshirt with black pants. 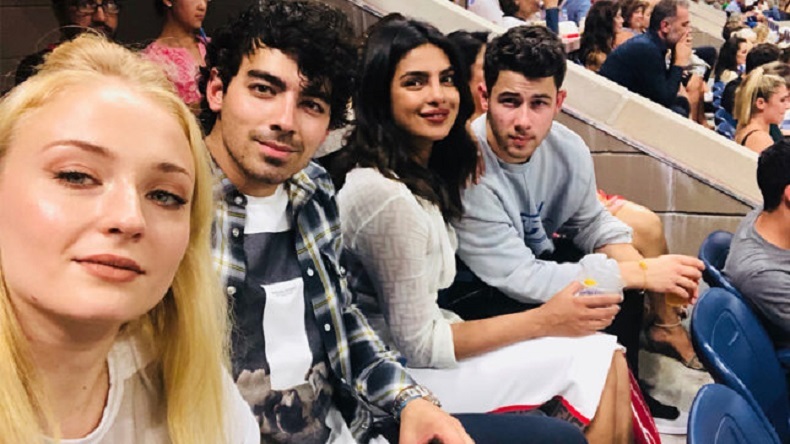 Along with them, Joe Jonas and his fiance Sophie Turner, Priyanka’s mother Madhu Chopra also accompanied them. Nick Jonas also took to Instagram to share a photograph. In this photograph, the couple is seen sitting together with Joe and Sophie. Both the couples happily pose for the shutterbugs. Also Read: Taimur Ali Khan is twinning with mommy Kareena and we can’t keep calm! There are a lot more photographs that are surfacing on the internet. Recently, the couple got engaged and the photographs were flooded on the social media after they performed the pre-wedding rituals. The families of the couple looked extremely happy. Later, the couple threw a bash for their friends and family to celebrate their togetherness. Although the couple hasn’t finalised their wedding date and venue. Speaking about the same, Priyanka Chopra’s mother Madhu Chopra said the couple hadn’t decided on their wedding date and venue. Presently, they wanted to concentrate on their work. Besides, there were baseless rumours that are doing the rounds on the internet. They would take some time to decide where they want it. On the professional front, Priyanka will be next seen in Shonali Bose’s The Sky is Pink. Along with Priyanka Chopra, the movie also stars Farhan Akhtar and Zaira Wasim. She will also be seen with Chris Pratt in her next Hollywood project, Cowboy Ninja Viking. While Nick Jonas’ latest single Right Now released last week.